Before I start talking about the installation process I must check whether you are aware of some little but very important things! First of all the Debian OS is divided into three releases, the stable release, the testing and unstable or sid. The “stable” distribution contains the latest officially released distribution of Debian.This is the production release of Debian, the one which we primarily recommend using. The “testing” distribution contains packages that haven’t been accepted into a “stable” release yet, but they are in the queue for that. The main advantage of using this distribution is that it has more recent versions of software. The “unstable” distribution is where active development of Debian occurs. Generally, this distribution is run by developers and those who like to live on the edge.The “unstable” distribution is called sid. Stable release is better for a server, testing for your pc and unstable (sid) if you are going to contribute to the Debian distro and you want to fix bugs and other. Personally I am using the testing release because it is pretty stable, not as the actual stable release but if you are installing this OS for personal use you will not have any problem and you will upgrade to the newer version of the packages quicker. the free ones which depend on non-free ones into contrib. 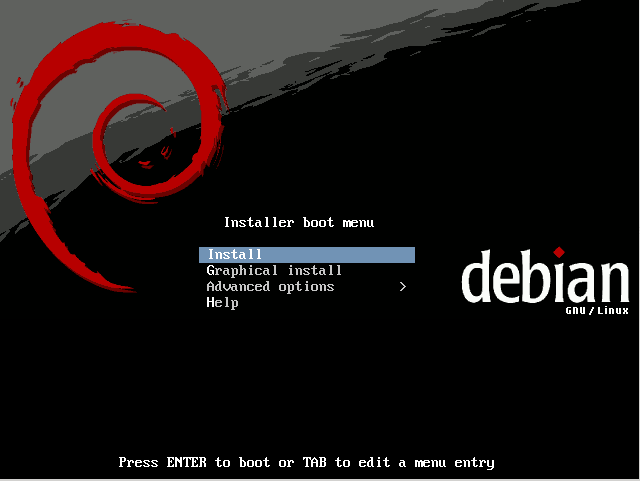 For more info about the Debian repository check this out. The Filesystem Hierarchy Standard (FHS) defines the main directories and their contents in Linux operating systems. The least that you must know is that the root directory (/) is the root of the entire file system hierarchy, and that users’ home directories, containing saved files, personal settings, etc. are saved under /home. 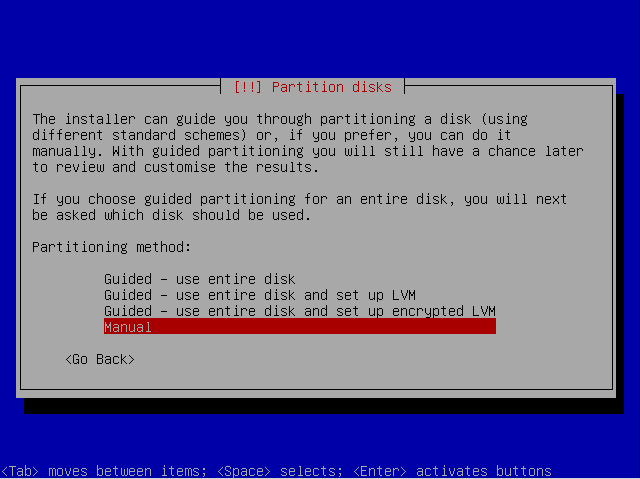 So a good idea is to have different partitions at least for your / (root) and /home (home) directories. This is because if you need in the future to format the /root directory for any reason (e.g. a crash that you can not fix) you can keep the /home directory with all the users’ data and personal settings. But enough with those tiring things… lets start talking about the installation process. I must note that one of the things that I am always scared of is to have my OS crashed when a deadline is approaching. So to face a problem like that and make a re-installation of my OS and having my configurations back in less than 45 minutes (it depends on your Internet connection), I make something like the followings. A “network install” or “netinst” CD is a single CD which enables you to install the entire operating system. This single CD contains just the minimal amount of software to start the installation and fetch the remaining packages over the Internet. So in order to install the Debian OS with the netinstall CD you must have primarily an ethernet connection to Internet. You just have to continue with the installation by following the install choice. I am not going to explain the whole process of the installation because it is the same as in all the OS installations (Ubuntu, Windows etc). But I must notice that when you will reach the point of the partitioning it is good to do it manually, either because you have other Operating systems intalled in some other partitions and you don’t want to overwrite them or because you want to partition at least your disk for a different /home (home) and / (root) directory, for the reasons that I explained above. The ammount of GB that you will dedicate to each partition is up to you. For the swap you can leave from 1 to 5 GB . It depends on your ram and the apps that you are running. For the / (root) partition a good ammount is about 30-40 GB if this will be your primary OS. The rest will be for the /home (home) partition. 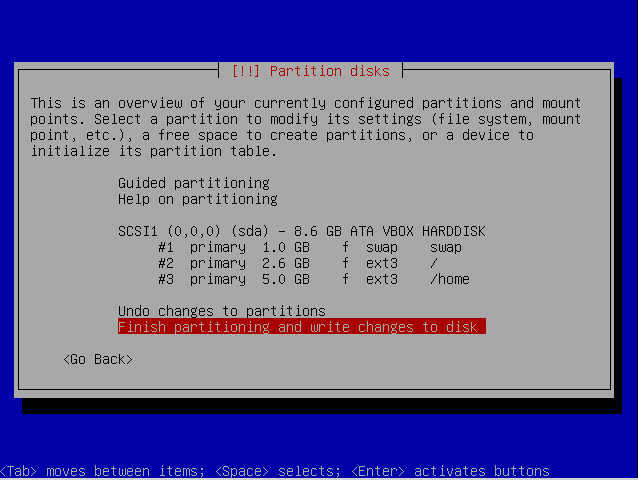 You must partition your disk(s) in a way that the / (root) partition will be smaller than the /home (home), because in your /home (home) directory you will keep your data. The partitioning should look somehow like the image below. I must notice that for a solid state disk is better to use ext2 file system and for a common disk ext3, or even better ext4 file system. When a screen like the following will be prompted you just have to choice to install the standard system… the rest will be installed and configured from the script that I attach below. I am always installing just the standard system because the repositories in the netinstall CD are set for the stable version of Debian and I am using the testing version for my desktop. So I install the standard system and then I log in to Debian and change the repositories to update the OS to the testing release. In this way I have to update just about some megabytes of software and not a bunch of gigabytes. 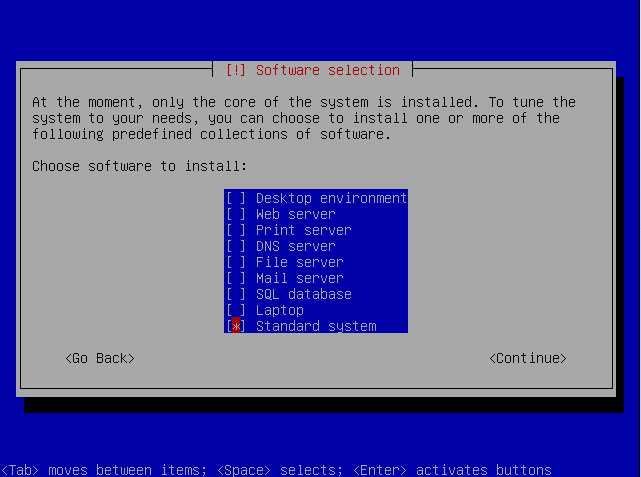 After installing the standard system, your PC will restart and ask you to login for the first time in Debian. Don’t be scared, it will be from command line because we had installed only the basics. The next step is to set the repositories (as I said before). Open with an editor (vi, nano etc) the /etc/apt/sources.list file that lists the “sources” from which packages can be obtained and wherever you see the word stable or the name of the stable release e.g. lenny (this is the name of the stable release now) change it to the release that you want to have… (testing, sid (for unstable), or keep it to stable)… If you want to have access to all Debian’s packages add after the “main” word the “contrib non-free”. You can find the Debian worldwide mirror sites here. In order to have access to the multimedia packages you will need also to install the debian-multimedia-keyring package with “dpkg -i debian-multimedia-keyring_2008.10.16_all.deb” (click on the previous link to download the package). Then you can install all the other packages that you may need… like a graphic interface, a web browser and others. Note that you may need to download and install some drivers too, like one for your GPU. I must repeat that the whole process may seem a little difficult, but if you are using Linux for some time, you’ ll probably know the most of the above. Fortunately for me and you, this is the END of this article!!! ps: Seeing the length of this article, I am not sure if anybody will ever read it. If you are the One, please comment (lol)! Isn’t it funny that you made a Freudian slip about “leaving Greece”? It’s just where you talk about the localized ftp servers. On their latest release, Linux Mint has a mintBackup package which is a nice GUI (gnome) application that can also export a list of installed packages and then import them back. Haven’t looked in the source code, but I guess there’ll be a simple python script doing all the work. Something similar would be a nice addition to your “installation script”, to dynamically install a list of packages (from a text file) instead of hardcoding them on a script and to get rid of those repeating “sudo aptitude -y install” lines. The problem is when I make a clean install, I don’t want to reinstall every package that I may have installed just for fun! Also I had made this little script, not only for personal use… when someone asks me to install Debian I just have to go through a few lines and see what he don’t want to be installed and not through some thousand lines of packages, that I don’t even know what they are about…. Very detailed installation guide. Quite an effort indeed. I often install with mini.iso which is about 7MB to download, and use a debfoster keeper file to let it install all the packages I need. I had no idea about mini.iso and debfoster! I am using Debian for the last two years and this is why I didn’t know about mini.iso. Nevertheless, I found it here and in the next installation I’ ll use it! I’ve always thought Debian to be a tricky one to install but your guide made it really easy and I did my first ever Debian install successfully! So thank you! Note that debian-multimedia now has a non-free section also. You probably want to include it. Thanks! I edited the post! Thing is, I’m sure that aptitude knows which packages were installed manually and which as dependencies. I guess there’s no way to just get the former ones huh? There’s may be, with debfoster as tw said here. I haven’t used this tool yet but I will… it seems very nice! Also recently I discovered that aptitude has a beautiful (terminal) interface from which you can administer your packages… I haven’t used it so much yet, but it seems really nice!